Stop for just a moment and think about how your day started and progressed forward, from the second you realized a new day had dawned until right now. Did it happen in blur of knee jerk reactions or was it orchestrated from one positive routine into the next? About 4 years ago I took a program based in getting mentally and physically healthy. While I learned a lot about my physical body to be sure the key component I walked away with was the mindfulness piece and the complete desire to make meditation a part of my daily routine. Here was my problem… sitting still long enough to truly meditate had always evaded my over-thinking mind. This time was different though because I decided to tailor my meditation time around something I have come to call my "morning momentum" time. Through this practice I have been able to read, journal, enjoy the beauty of the morning and yes, meditate. Simply breathe and feel how good it feels to be alive. Each morning this time of year I move from bed, to the coffee pot to my yoga mat in my garden. It has changed the caliber of my thinking and the beauty of each day. This is where I get most of my ideas for this weekly Victory Letter you are reading. Late last year I decided to create a program based on the tools and methods I use in my own practice. Some of you reading this have participated in my Morning Momentum Program and I thank you for your time and investment. Your feedback took a great idea and made it into a self-sustaining learning platform. 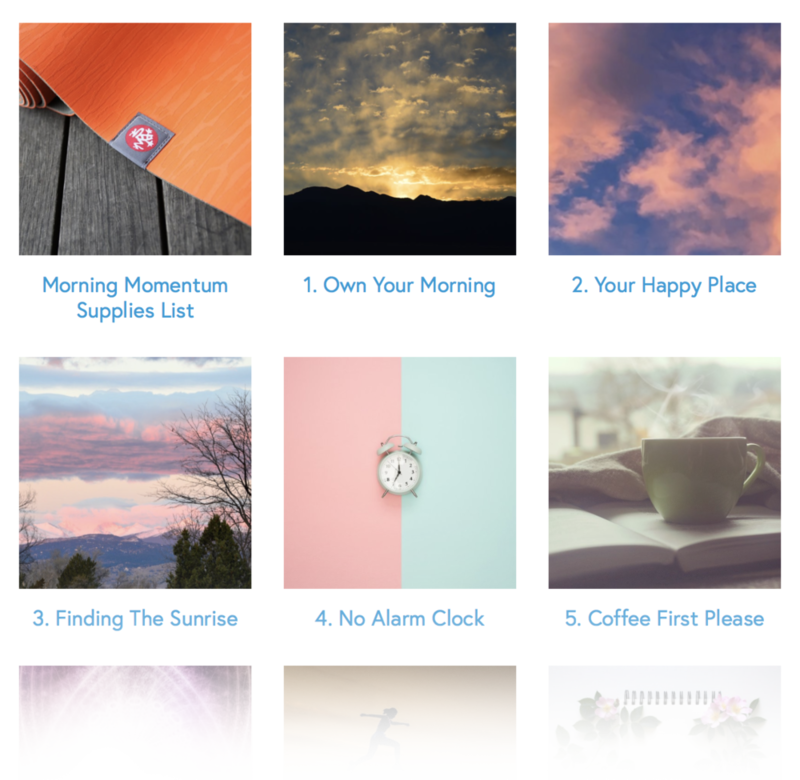 Recently as I sat on my yoga mat one morning and thought about how to better serve my message to the world, a voice from within told me to make my Morning Momentum Program free to the public. It's an idea that just feels organic and easy for my audience to grow like the tree I was sitting below! Whether you are looking to start from scratch or further enhance a certain aspect of your morning routine, my goal is to help you start each day a positive way. Today is the day I give you all the tools you need to have a great morning routine. It's free and only requires the amount of time you are willing to invest into your own morning. I always recommend giving yourself the time you deserve - it makes a huge difference in what you do next.